Great Wolf Resorts, Inc. celebrates the grand opening of its highly anticipated Great Wolf Lodge Minnesota. Located in the city of Bloomington, the resort is the perfect year-round family getaway with an expansive indoor water park and an adjoining adventure park featuring interactive attractions and activities that kids and parents can enjoy together. Guests are never more than a few feet away from the next great adventure at Great Wolf Lodge Minnesota. Starting with the 75,000 square foot indoor water park and the brand new Great Wolf Adventure Park featuring a ropes course and climbing wall to a wide range of complimentary kids activities including arts and crafts, dance parties, and more—the fun won’t stop from morning to night. The centerpiece of the resort is the 75,000 square foot indoor water park, perfectly heated to an ideal 84-degrees and featuring water slides and attractions intended for children of all ages. Signature water rides and attractions include Totem Towers, the three story body slides; Wolf Rider Wipeout, an indoor surf simulator with ocean-like waves that reach five feet; Slap Tail Pond wave pool; and Fort Mackenzie – a multi-level interactive tree house with a massive tipping water bucket. The water park also features a winding lazy river, and a zero depth entry pool with water features perfect for the littlest of wolf pups. Additionally, Great Wolf Lodge Minnesota debuts a brand new slide—River Canyon Run featuring Splash Cinema. Guests choose a movie theme and then as they splash through the slide, lights and music are projected to amplify the exciting ride experience. One ride won’t be enough, as there are four different adventures to choose from. The adventure doesn’t end once resort guests dry off. 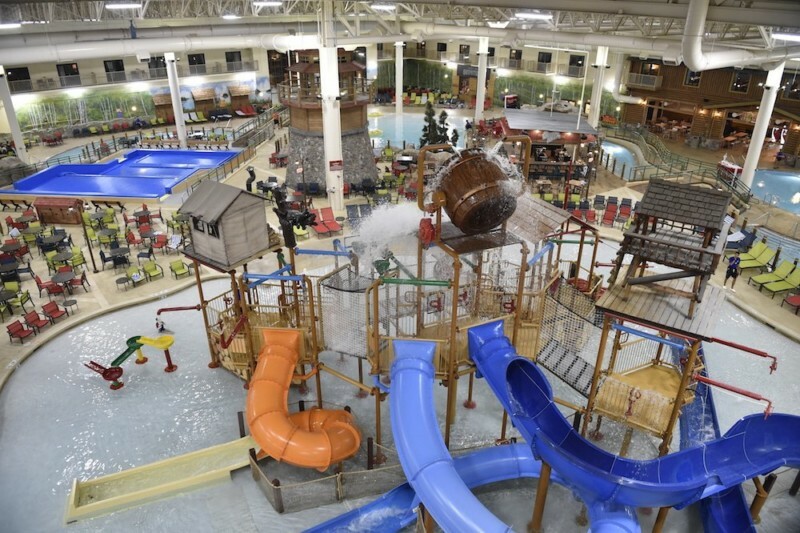 Great Wolf Lodge Minnesota has dozens of weatherproof, year-round activities and entertainment offerings throughout the resort. 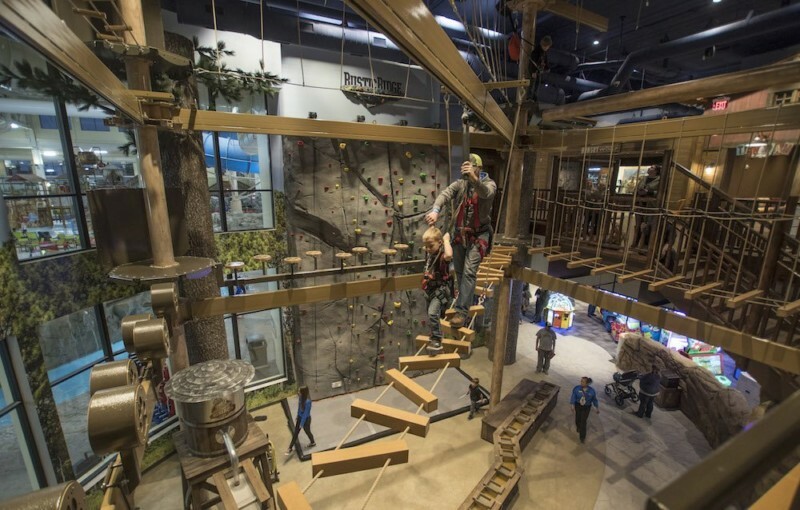 The Great Wolf Adventure Park houses several attractions, including the Rustic Ridge Rock Wall and the Howlers Peak Ropes Course, where guest embark on an invigorating, multi-level climbing challenge. Guests can also search for keepsake gemstones at the brand’s exclusive mining experience, Oliver’s Mining Co., bowl a strike at Ten Paw Alley or explore a variety of games at the Northern Lights Arcade. 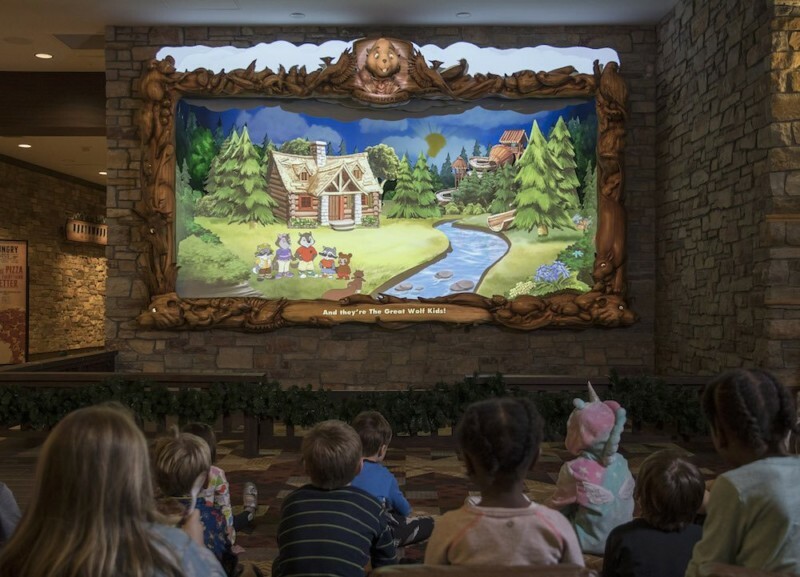 Great Wolf Lodge Minnesota debuts the brand new Northwoods Friends Show, an innovative and first-of-it-kind animated projection show in the Grand Lobby. Utilizing projection mapping technology on a moving, three-dimensional multiplane surface, the Northwoods Friends Show, for which Entertainment Design Corporation (EDC) provided concept, design, and construction administration services, creates an immersive environment that draws children into the world of the Great Wolf Kids characters. Additional activities include MagiQuest, the brand’s exclusive live-action adventure game where players follow clues and use interactive magic wands to discover relics and runes needed to defeat a fierce dragon; and the Great Wolf Candy Company, a sweet stop to create a personal candy mix from bulk candy choices. Daily children’s activities can be found in the Grand Lobby including Yoga Tails, a fun and creative yoga class, and evening Story Time by the fireplace – a Great Wolf Lodge family tradition. Children will also enjoy the chance to meet and greet with their favorite Great Wolf Kids characters, including Wiley the Wolf, several times daily. For more information on Great Wolf Lodge Minnesota or to make a reservation, visit greatwolf.com/Minnesota.